I know someone that would kill me for saying "the Spinal Tap of animated movies". 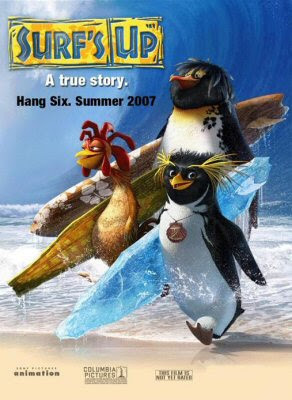 Being a true mockumentary or not, Coming Soon's "Exclusive: A Preview of Surf's Up!" article is still interesting. The description of the movie sounds like the "documentary/mockumentary" part only happens at the beginning, as seen in the trailer, but then gives way to the more traditional approach. Although later on it says "In another scene, the Tank shows off his trophies to the documentary crew, explaining how he's named all of them after women. It's pretty funny but even moreso when his mother calls from off-camera embarrassing him." So maybe it switches every now and then between styles? Let's wait and see. I definitely want to see it though.